Being a pin snob, I am very particular about which pins I use for each task. 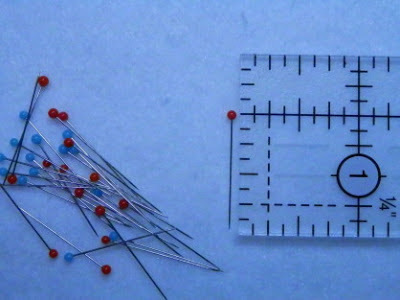 My most favorite pins for hand piecing were the Little House pins (made in Japan) that came in a cute glass jar. Several years ago, they seemed to disappear from stores and catalogs in America. Never fear, I had so many a few bottles in stock. 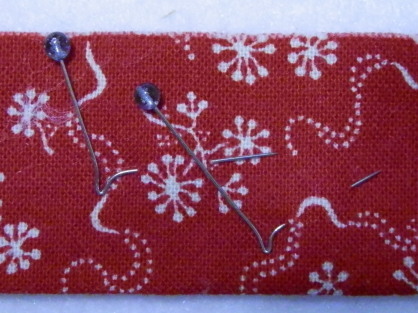 But parading my special pins in classes when students could not get them seemed mean. So I started searching for an alternative. 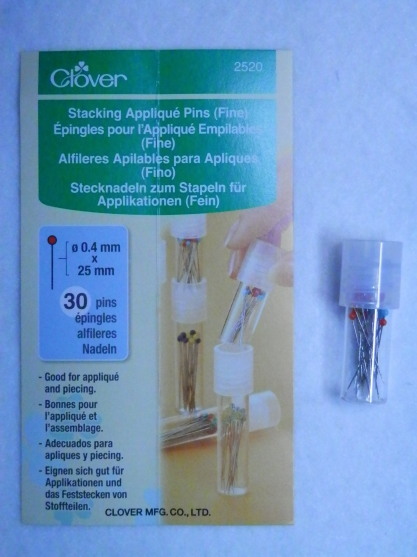 A few months ago, I found Clover #2520 pins at Keepsake Quilting and on Amazon. So I ordered two bottles. 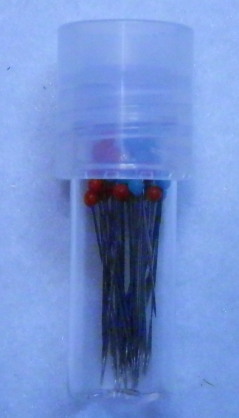 There are only 30 pins per bottle (15 blue and 15 red). 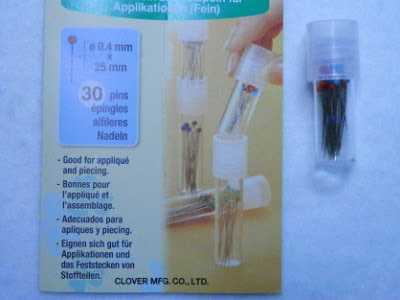 Small tubes which you can stack for storage, but I put all mine on pincushions (wool, of course). A bit of a close-up of the packaging. 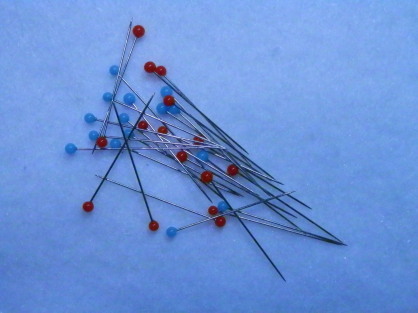 All 30 pins in their glory. 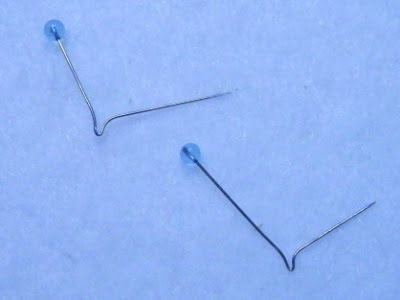 At just under 1-inch long, with glass heads, they are not as apt to stick you while you are sewing. Okay, the glass heads have nothing to do with sticking you, but you can iron over them. Here they are in action. Surprisingly, I like them better than the Little House pins, which I thought would never happen. It has snowed, it has sleeted, and now we are getting the freezing rain. I hate ice. Hard to walk on, harder to drive on. Please be careful if you need to be out and about early on Wednesday. I've been doing a bit of knitting and a bit of quilting. Nothing too exciting yet, but the wheels are still turning about the new stuff. On Sunday, I was certified in Reiki Level One! It's an interesting process and a bit different from what I am doing on the horses. But enough similarities that I didn't feel overwhelmed. And it's exciting to learn something new. I'm reading Hiss and Hers by M.C. Beaton, and listening to Severe Clear by Stuart Woods. I know this is short, but you know I am still alive! I bet you've forgotten how special you are. Just the act of living a life takes its toll and we seem mired in place. Same old, same old. Let's try something and see if it catches on. Each day lift your head and look around you--really look. (I see some of you rolling your eyes...that's NOT looking!) Look for something that makes you smile, something that makes you gasp in amazement, something that makes you sigh with pleasure. Notice the trend? Look for something good! It really is there. Some days you will have to look hard, but you won't be disappointed. It's surprising how looking for the good becomes a habit. Your spirits will lift and you will just look at life differently. Let's become "the-glass-is-half-full" people instead of "the-glass-is-half-empty" people. Working, living or playing with grumpy people? Smile--smile big--make them wonder what you're up to. You can share your good things here, share them with a friend or significant other--or just keep them to yourself. Everyone's good things will be different--but it'll all be good. I've been doing this for a couple months now and I can see a difference. Join me? Ahhhh, Valentine's Day. You either love it or hate it. I was in a small shop this afternoon and it was filled with men, young and old, trying to pick the perfect gift for their sweethearts. And then there was the old stand-by...flowers from the 7 Eleven! My husband used to bring me flowers every Friday. And he usually brought them to my mom as well. A good old Southern boy...his mama raised him right! The quilt above is one I made several years ago. The lettering is from A Quilter's Alphabet by Anita Shackelford (more info here). 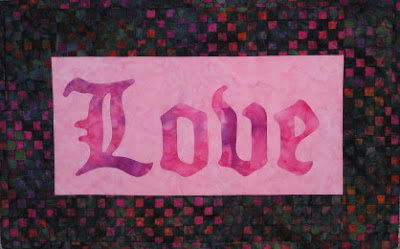 I've used that Old English alphabet numerous times over the years for both applique and quilting. P.S. I am so excited!!! See the blue, underlined "here" above? I finally figured out how to make the link without having the complete URL in the blog! Underwhelming news? Yes, I know--really only a personal best for me--thus the "personal". If I hadn't seen this with my own eyes, I never would have believed it. I was recently gifted with these two extra lovely pins. They were presented on this strip of red fabric to preserve them. A closer look. 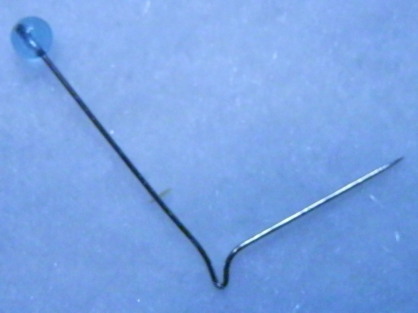 The needle hit the pin dead center and forced it down into the needle hole of the throat plate. Yes, it was a Featherweight. And, even harder to believe, it happened again several weeks later. 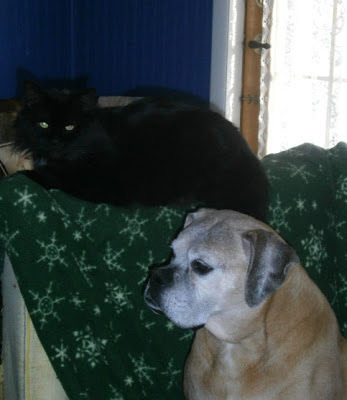 The offender saved both so that they could serve as a horrible warning on the blog. I was asked, yet again, to preserve the anonymity of the offender, even though there is no doubt that this person is guilty. The Featherweight is known for its ability to sew over pins so this really is an anomaly. So be careful out there! Thanks to everyone who commented on the last post. I'm better now; just hit a bump in the road and made a brief detour. Thanks for listening. WARNING: This is a rather sarcastic post. Proceed at your own risk. You've been warned. Must be no one has missed me--or at least not enough to leave a comment about it! So I will just do a bit of rambling for tonight. On a recent episode of Blue Bloods (hubba hubba Tom Selleck! ), some of the family were out bike riding. The youngsters had helmets on, but not the aunt/mom. An accident ensued, with the youngest rider, having unbuckled his helmet at a rest stop, having head trauma and going into a coma. Now--in the interest of setting a good example on tv and as the aunt/mom, why wasn't Erin wearing a helmet? It could just as easily been her that was hurt and it would have been worse without a helmet. Speaking of helmets, it amazes me the number of horseback riders who don't think they need a helmet. Really? Anyone can be thrown at any time, even on the tamest horse. You just never know. So why take a stupid chance? Several ideas for new classes are running amok in my brain. I'm excited to get things on paper, but know that if I wait a bit, the final ideas will be better than what I can do now. Stay tuned! And one final mini rant. 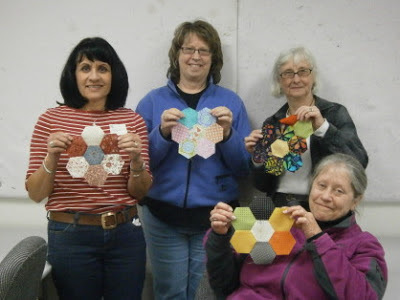 In a recent quilt magazine, a well known designer said, in essence, not to worry about your piecing skills, because it just won't matter if you cut off points. Really? There's no shame in cutting off points if you have done your very best and that's the result. But to just not worry about them at all? Pass the chocolate--I feel faint. 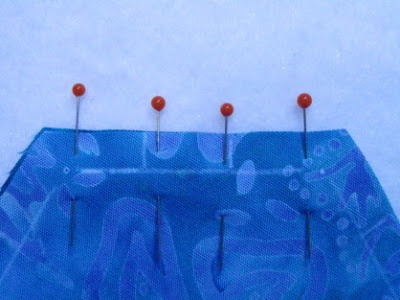 http://www.sharonstroud.blogspot.com/2013/01/a-tutorial-on-posting-blog-comments.html. You may want to practice up--there may be a contest coming up where those skills will come in handy. That's it for tonight. I'll try to be less snarky next time. P.S. I am listening to The Forgotten by David Baldacci. 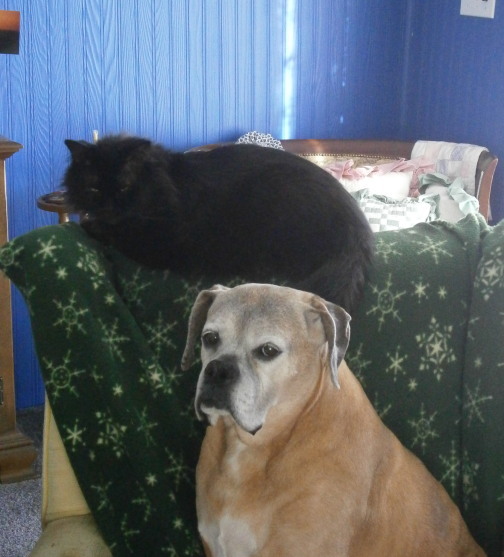 When there were just female animals in the house, it was easy to classify everyone as "The Girls". Now that there are one of each, it was hard to decide what to call "them". After due consideration, I came up with "The Lentils". I think it's safe to say that "The Lentils" are getting along just fine. 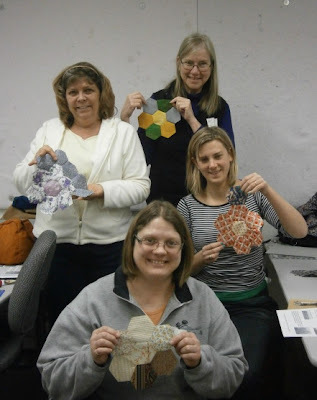 Clockwise from center front: JoAnn, Cindy, Linda and Daisy. And left to right: Vickie, Connie, Pam and Vicki. We had batiks, dots, French General, charm squares, scraps (and had a really good laugh over a scrap we think was from the 70s! ), fabric from the Victoria and Albert Collection in England...what a range! Thanks, Ladies, for a great day...I'm still laughing! Hope you are too! P.S. Thanks for all the good thoughts for my tree...so far, it's still standing!